Kenttec, can also offer automated gate access, wireless links and keypad entry. 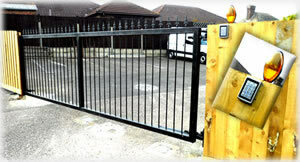 Whether you need a sliding, swing or underground gate, we can fit and maintain it. With keypad entry, and direct access to your phone system, we are the ones to call. Sleeping policemen, intercoms, remote openers, even automates garage doors. Automation is becoming very popular. We can extend your networks with wireless technology, as well as installing Vlans and firewalls to keep your sites secure.